To begin, it is important to remember the nature of strawberry plants. They are prolific, can be somewhat invasive, and most varieties will quickly form a thick matted row made up of strawberry runners if left alone. Because of this, it is best to think in terms of which plants can help strawberries grow, not the other way around. While strawberry plants themselves hurt relatively few other plants (the exception will be discussed below) by being planted near them, their rapidly expanding range can end up depleting nutrients or competing with other plants if they aren’t actively monitored. This herb is a virtual magic bullet when it comes to companion planting. To learn about its relationship with the humble strawberry, click the link just above for detailed information. The common bean is known benefactor of strawberry plants. It repels some beetles and hosts nitrogen-fixing bacteria which serve to fertilize the soil for better strawberry yields. Caraway is another herb that indirectly benefits strawberry plants by being nearby. The primary benefit of caraway is that it attracts parasitic wasps and parasitic flies that are voracious predators of many common strawberry pests. This flower is actually a legume. Like the beans mentioned above, it also fixes nitrogen in the soil, thereby fertilizing for surrounding plants, including strawberries. It also attracts honeybees. Not all plants will even tolerate the presence of strawberries, however. The most notable garden plants that are harmed by the proximity of strawberry plants are those related to the cabbage. Avoid planting strawberries near members of Brassica oleracea. The cabbage family plants will have their growth impaired by strawberry plants close by. The major members of the cabbage family include: broccoli, broccoflower, Brussels sprouts, cabbage, Chinese broccoli, cauliflower, collard greens, kale, kohlrabi, and Romanesco broccoli. The most common of these plants are tomatoes, potatoes, eggplant, and peppers. If these plants (or melons, okra, mint, bush or bramble fruits, stone fruits, chrysanthemums, and roses) have been grown in the same spot recently (within 5 years), it is best to grow your strawberry plants elsewhere. Otherwise, the strawberry plants may be infected and die themselves. The strawberry companion plants listed here are the well-established ones that have consistently demonstrated the mentioned benefits or drawbacks. However, there are surely more plant species out there that will interact either positively or negatively with strawberry plants. If you are aware of other plants that interact with strawberries, share your knowledge! You can tell us about your experiences by leaving a comment below, and start companion planting strawberries today! Hi! I have a Meyer Lemon tree in a half-wine barrel and I’m wondering if strawberries can be planted successfully around the perimeter in the same barrel with the lemon tree. Any thoughts? Thanks! 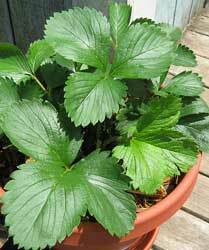 Yes, it is recommended as the strawberries will act as a kind of natural watering reminder and when ever the strawberry plant starts to wilt(they will do so easily, and always recover) you will need to water. For more info look up IV Organics on YouTube and it is one on the older vids on companion planting. Hi, I planted strawberries around my 4 year old blueberry bushes and they have done very well but now the blueberries aren’t looking so good. Could it be because of the strawberries? I fertilized them, added a little peat moss and coffee grounds to beef up the PH. Hi I’ve accidentally planted carrot seed in my strawberry container. Will this kill the strawberries? Will the carrot still grow? From what I know, this shouldn’t kill the strawberries unless the roots get messed up by the carrot, but I don’t think the carrot will do well. They need unhindered space for the carrot itself to grow, and the strawberry roots might interfere with it. I’m not sure what kind of carrot you planted nor what size of container, but if the carrot is too big for the container, it might become stunted or deformed.